The first book in a spooky new series for only the bravest of readers--perfect for fans of The Spiderwick Chronicles!Anna and Max love scary stories, but when they find a mysterious knife on a dark and stormy night in Transylvania, truth becomes stranger than fiction. Brought to a spooky inn at the edge of the woods, the siblings find themselves dragged into a world of monsters and magic...and it soon becomes all too clear that vampires are not just a fairy tale.When Max mysteriously vanishes, it's up to Anna to find him. 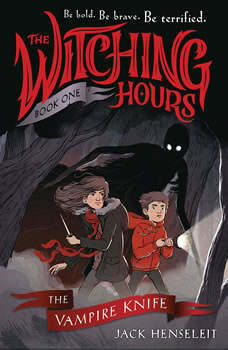 But can the siblings find a way to survive their own scary story?This deliciously creepy book is a modern Brothers Grimm tale, full of adventure and fun frights that will have readers jumping in their seats and ripping through the pages to find out what happens next.